April is National Heartworm Awareness Month!! During the month of April, receive 50% off your pet’s heartworm test with the purchase of 6 or 12 months of heartworm preventative! As always, no appointment is needed - just walk in! Announcing Smith Vet Weight Loss Project!! Beginning March 18 we are starting a weight loss program for overweight pets, including a free sample starter kit of food & treats, weigh-ins, pictures, and a personal coach. For further information, please call and ask for Jessica at 505-982-4418. Our canine reception desk (and smiling CSRs! ), as seen from the west side entrance. 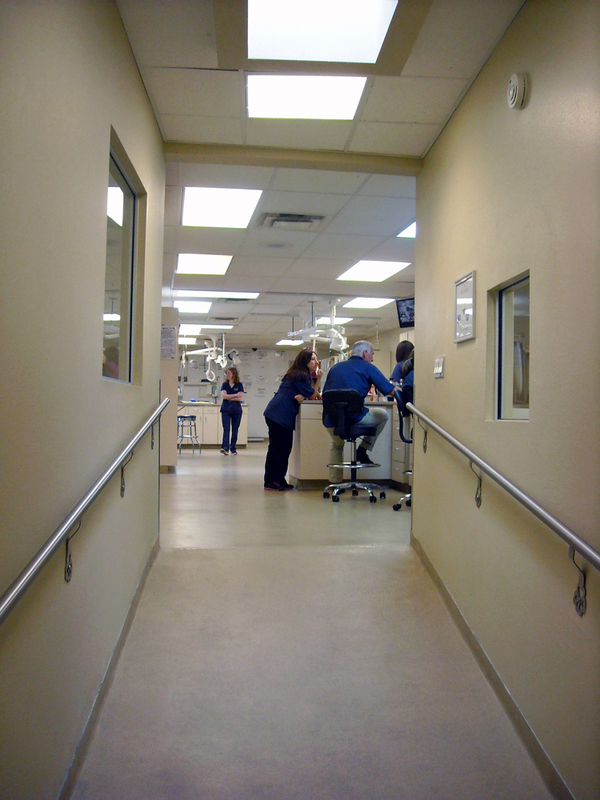 One of the main canine hospital entrances- the urgent care entrance is on the same side of the building, to the right. At left is the feline hospital, in the center (behind the trees) is our dog-walking area, and the back of the canine hospital is at right. A view of the east side entrance of the hospital, taken from Alta Vista street. The door is under the awning at left. The east entrance to the canine hospital, looking south from the corner of Alta Vista and Luisa streets. The orange dog on the sign was a part of Smith Veterinary Hospital in its original location on Pen Rd. Behind those vision blocks is the canine surgery suite; behind the windows on the right is our laboratory, and further to the right (out of frame) is the east side entrance to the hospital. Our urgent care entrance is on the west side of the building, south of the main lobby entrance. At night, the sign illuminates to mark the door clearly. We have extended Urgent Care hours from 6 PM to 10 PM, Monday through Friday. You can access our urgent care reception area from the parking lot on the west side of the building- just look for the big neon sign. Our lobby has seating right next to our special children's play area! 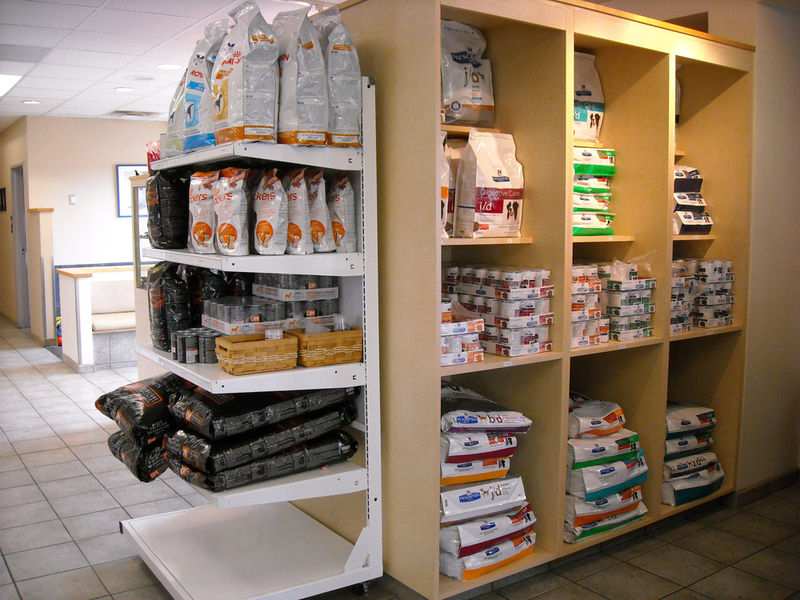 We stock a wide range of diets from Hill's/Science Diet, Royal Canin, and Purina, and we can generally special-order any food we don't stock! We stock a wide range of diets from Hill's/Science Diet, Royal Canin, and Purina, and we can generally special-order any food we don't stock! Check out the treats on top! This is what you see when entering the building through our urgent care door. Our urgent care reception desk is to the left, urgent care entrance to the right, and urgent care exam rooms ahead. Enjoy the view- your dog will too! We have a full suite of laboratory diagnostic equipment, including chemistry and hematology analyzers, to provide results as quickly as possible! Up the ramp to the canine treatment area! Laboratory through the window to the left, pharmacy through the window to the right. If you turned completely around, you would find the door to the urgent care reception area! 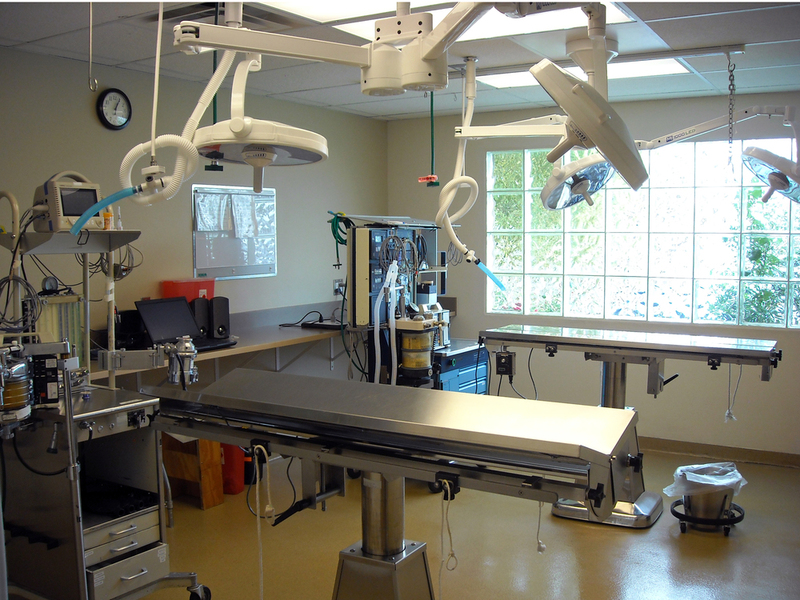 To the left are the canine surgery suite and ultrasound room; to the right, our x-ray suite. In this view, you are looking back down the ramp- the door in the upper-right quadrant of the picture leads to the urgent care reception lobby. We use padded troughs for patient comfort during ultrasound procedures. Two heated, adjustable tables, state-of-the-art (and energy efficient!) LED lighting, and complete vital signs monitors for each table. We walk patients in a safely fenced-in area with trees and shade! 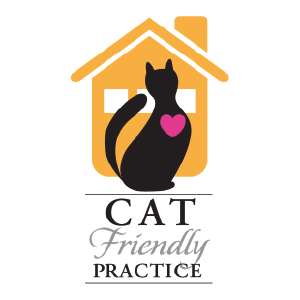 We are Santa Fe's locally-owned walk-in veterinary hospital. 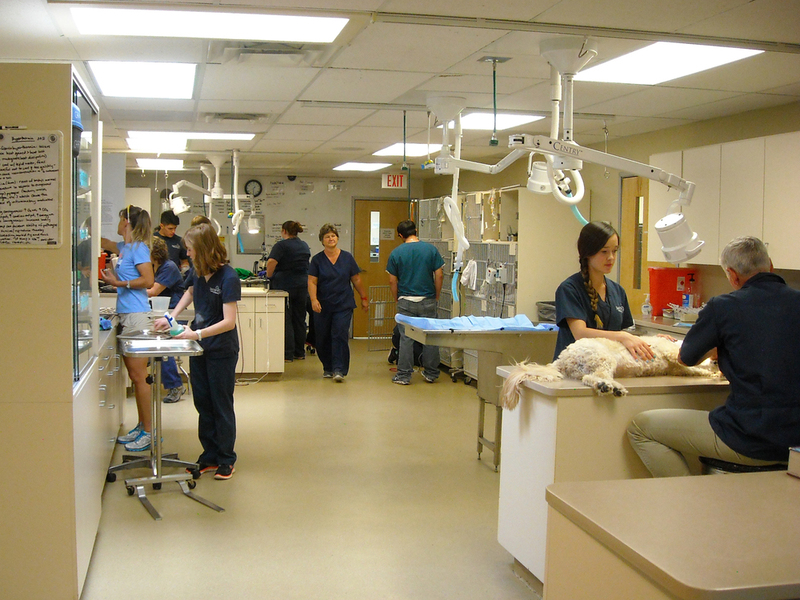 Our state-of-the-art hospital, 18 veterinarians, and highly trained staff offer your pet the highest quality in medical, surgical, and diagnostic care. We have on-site laboratory, x-ray, and ultrasound equipment, as well as a fully-stocked pharmacy. We perform elective and emergency surgeries, pet dentistry, and provide a full range of preventive care treatments should your pet need vaccinations or parasite prevention. 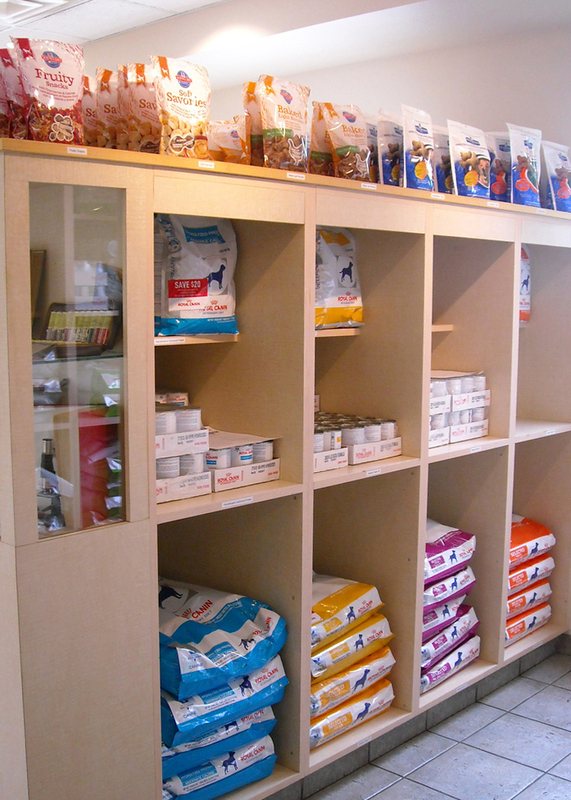 We also offer acupuncture, a wide variety of prescription pet foods, and boarding facilities for cats. Smith Veterinary Hospital has been providing professional animal care to Santa Fe area pets on a walk-in basis since 1946. We are open Saturdays and Sundays, plus we offer extended hours for urgent care from 6 PM to 10 PM, Monday through Friday. Unless you're scheduling an elective surgery for your pet (like a spay, neuter, dental cleaning, or growth removal) you can just walk in with your pet- no need to call or set up an appointment in advance! We are only closed on New Year's Day, Easter, Memorial Day, Independence Day, Labor Day, Thanksgiving, and Christmas. Smith Veterinary Hospital is proud to have been accredited by the American Animal Hospital Association since 2004. 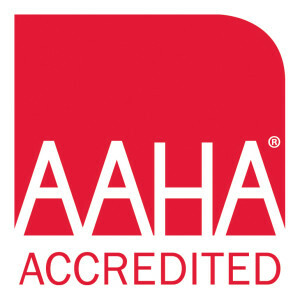 We are one of only 29 AAHA accredited clinics in the state of New Mexico. Click to learn how AAHA accreditation influences your pet's care. Traveling and want to find an AAHA-accredited hospital near you? Visit aaha.org/locate. @AVMARecallWatch tracks pet product recalls/alerts. If you have an emergency outside our regular business or urgent care hours, please contact the Santa Fe Veterinary Emergency and Specialty Center at (505) 984-0625. Driving directions and Google map here.